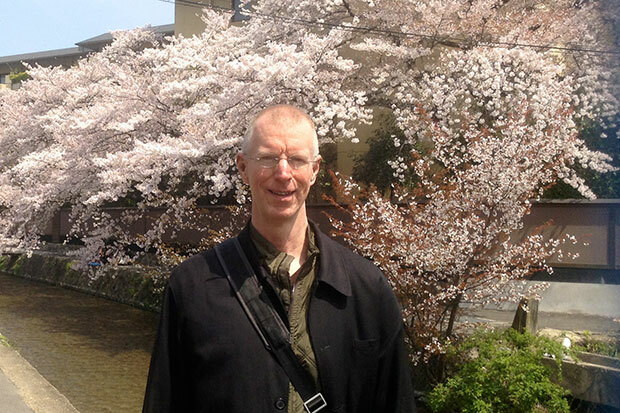 American poet and author Patrick Donnelly is in the midst of a fellowship visit to Japan. While there, he is immersing himself in the world of Japanese poetics–at the intersection of the past and present. In addition to having written two books of poems, he has co-translated, with his spouse Stephen D. Miller, classical Japanese Buddhist poetry. 141 of their poem translations are included in The Wind from Vulture Peak: The Buddhification of Japanese Waka in the Heian Period (Cornell East Asia Series, 2013). The pair continues to work on many other translation projects. Donnelly is the director of the Poetry Seminar at The Frost Place (a poetry conference center at Robert Frost’s old homestead in Franconia, NH). He has taught at Smith College, Colby College, the Lesley University MFA Program, the Bread Loaf Writers’ Conference, and elsewhere. The associate editor of Poetry International is currently enjoying his stay in a beautiful traditional Japanese home he found on SabbaticalHomes.com. We are honored to have caught up with Patrick Donnelly and learn more about his work and travel experiences. Congratulations on your fellowship with the Japan-US Friendship Commission! Please tell us more about the organization and what you’ll be working on while in Japan. Every year since 1978, the Japan-US Friendship Commission, in collaboration with the National Endowment for the Arts, the Agency for Cultural Affairs in Japan, and the International House of Japan, has funded five US-based artists to spend three months in Japan. Artists in any discipline or genre may apply; usually one of those chosen is a writer. Like most things associated with the business side of the arts, the fellowship is a competitive process, and I’m thrilled to have been given this opportunity. As of this writing, I’ve been in Japan one month. During my time here, I hope to amplify the influence of Japanese poetics—already strong—on my own poems, extending a literary influence to an experiential one. I’m exploring conversations between Japan’s classical past and its unsentimental present in person and in my writing. As well, I’m conducting informal interviews with both writers and non-literary “civilians” in Japan about how they view the Japanese classical poetic heritage. For instance, I had a poetry conversation with some Americans on the Chuō line in Tokyo; when they learned I am a poet, one said her favorite poet was William Stafford, and she quoted me a few lines. I’m inspired and challenged to be alive in these times which are both thrilling and troubling, and grateful to share life and work with so many superb people—especially my spouse Stephen, who opened the luminous world of Japan to me, as well as so much else. If you could destroy one myth about poetry what would it be? That it is an art form only “special” people can participate in. If the incomparable 1,500-year achievement of Japanese poets can show us anything, it’s that regular people have deep poetry in them. Or, put another way, there are no “regular people”—to be human is to be an artist with the materials at hand. What are some of the most important logistical concerns you encountered while planning your trip to Japan? Planning to live abroad for three months, which I’ve never done before, was both exciting and daunting. I made an extensive To Do list, and crossed items off as they got dealt with: travel plans, housing arrangements, currency exchange and access to funds, cultural visa from the consulate in Boston, arranging to stay in touch by Skype with personal and professional contacts, introducing myself by email to both writers and others in Japan prior to my trip, health insurance, medications, planning for readings and presentations here, shipping my books, studying Japanese—all of this occupied me for the better part of a year before my trip, while teaching and living the rest of my life. Happily, I’m able to report that all this preparation paid off, and I am having the adventure of a lifetime. How do you feel the personal connections provided by the academic community are a benefit for your travel needs? As an adjunct or visiting faculty at all the places I’ve taught, it’s hard for me to view myself as a true academic, or only as an academic. I’m an artist, and also a teacher of and about the art I practice. That said, I do teach, and like many “dual-academic” couples, Stephen and I have had trouble finding two full-time jobs in one place; he has tenure at UMass Amherst, and I work where and when I can. While this situation has sometimes been challenging, every artist (and every person) has to surmount a myriad of obstacles to do good work, and simply to live. I’m experiencing this incredible opportunity in Japan due to the support for my work of many people and organizations inside and outside of academia, and I’m grateful to them all. What did you enjoy most about your experience finding a home to rent SabbaticalHomes.com? When I first began to seek rental housing in Kyoto, I posted queries on many sites, including SabbaticalHomes.com. About ten days into my search, I received an email from the owner of Natsugasumi (Summer Haze) Vacation House in Kyoto inviting me to consider this lovely property as a place to rent. I’m very grateful to the site for connecting me with this wonderful property and owner, who has gone out of her way to make me comfortable here. The house is not only beautiful, and located in a lovely area near public transportation, but considering all the amenities it provides, very reasonably priced.